The weekend was spent “umm-ing” and “ahh-ing”, wondering who the “special visitor” on Monday would be. Speculation was rife, was it a musician, an artist, Lionel Messi? 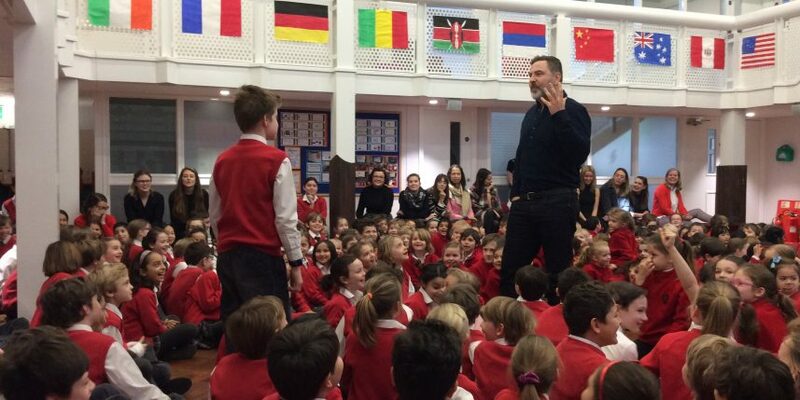 After an ear deafening drum roll, none other than David Walliams himself strolled into the hall to gasps and cheers from the students. He read an extract from “Gangsta Granny” and “Windy Mindy” (“The World’s Worst Children”), answered questions about what it takes to become an author (and comedian), and even handed out some signed copies of his latest novel, “Fing”. A huge thank you to the family from year 2 who bid for this at a charity auction. Chepstow House, teachers and students, are beyond grateful. What a fantastic start to the week! *This is NOT an April Fool’s joke!